Presentation Folders, also referred to as Pocket Folders or Portfolios, are sturdy folders used to store and organize documents such as those distributed during a sales meeting or other presentation. 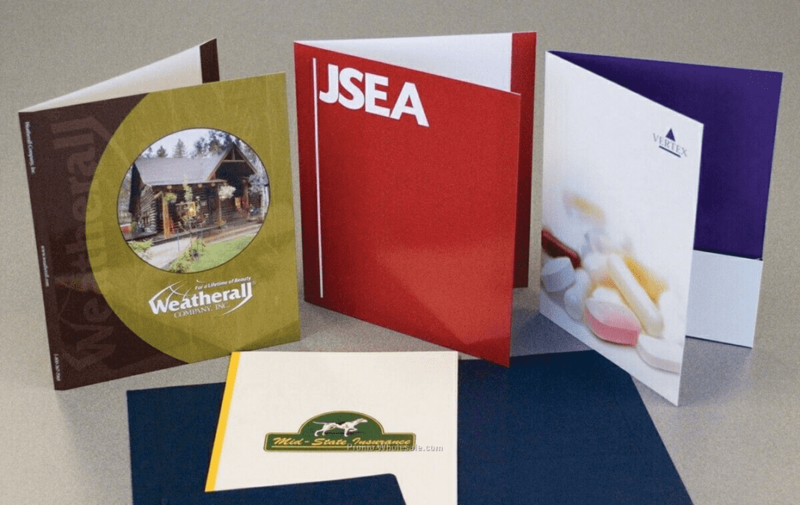 In addition to securing documents, a presentation folder serves as a means to introduce and promote your organization to new clients as well as enhance your image with existing clients. A high-quality presentation folder helps make the statement that your firm is organized and professionally run. A presentation folder is usually printed on both the front and back cover. Printing on the face of the interior pocket flaps is also very popular and adds little, if any, additional cost. The printing can be one-color, two-color or full color, and largely depends on your budget and the image you want to convey. Metallic foil and/or embossing are sometimes used in place of the printing or to complement the printing. Many sizes and configurations are available, but the most common size of a presentation folder is 9” x 12” (in the closed position). This size is the most economical choice and is ideal to hold brochures, sales literature, contracts and any other documents measuring 8.5” x 11” or smaller. Two interior pockets with horizontal flaps is the standard design most people choose, however there are many different pocket configurations from which to select. Because sturdiness is important, a presentation folder is made from heavy cardstock for lasting durability. Reinforced edges, business card slits, and an expandable spine are additional options worth considering. Also, presentation folders generally have a clear protective finish such as UV or aqueous coating or, in some cases, a plastic laminate. If you are looking to add some creative flair, we also have a selection of dies for creating sculptured pockets. Unlike standard rectangular pockets, sculptured pockets have attention-grabbing shapes that can be printed with artwork that reinforces the theme of the presentation and your corporate identity. If you have an upcoming Presentation Folder project, give Formax a call at 866-367-6221 or use our Contact Form or Quote Form at the bottom of this page. We look forward to assisting you!